The pioneer plants that become agricultural weeds are nature’s recovery crew, well designed to begin the process of restoring soil that has been disturbed and left exposed to the elements. They do a good job of protecting the soil surface, rebuilding organic matter, and feeding the soil life. However, they tend to get rowdy and are hard to evict when it is time to grow some food. What to do? Hire some good cover crops to do the work instead! In addition to being much easier to manage, cover crops actually do a better job of soil restoration than most weeds, generating more biomass and, in the case of legumes, fixing nitrogen (Fig. 1). Choose the right cover crop for the season, and you can usually fill empty niches in your crop rotation faster than most weeds can get a foothold. Figure 1. A summer-planted cover crop of pearl millet–sunnhemp in the Tidewater region of Virginia (hardiness zone 7B) has really "put the weeds out of work" by forming a dense stand 7–8 feet tall within 65 days after planting (right). When cover crop shoots were removed to estimate biomass (which was 4 tons per acre), virtually no understory weed growth was seen (left). Figure credits: Mark Schonbeck, Virginia Association for Biological Farming. Cover crops will not solve all weed problems, nor will they make the following vegetable so weed-free that you won’t have to cultivate or pull any weeds. Yet, cover cropping is one of the more important "little hammers” (Liebman and Gallandt, 1997) of ecological weed management. Skillful use of cover crops can often reduce weed control bills and limit weed seed set while fields are not in production. In addition, cover crops perform many other vital functions: replenishing soil organic matter, feeding the soil life, adding nitrogen (legumes), making other nutrients more available, preventing erosion losses, and providing habitat for beneficial insects. Be sure to take these benefits into account when evaluating the economics of cover cropping as a weed management tool. One limitation of cover cropping can arise when the cover crop is incorporated into the soil as a green manure. This tillage tends to reopen the niche for weeds—at least until the subsequent vegetable crop becomes established and occupies the soil. The decomposing cover crop residues can inhibit, not affect, or even stimulate weed germination and early growth, depending on cover crop species, quantity and maturity of cover crop residues, soil conditions, and species composition of the weed seed bank. As a result, green manures do not consistently reduce weed pressure in a subsequent cash crop. Over the past 25 years, farmers and researchers have sought to address this problem by experimenting with no-till cover crop management prior to vegetable planting. In these systems, a mature (flowering/heading) annual cover crop is terminated by mowing, rolling, roll-crimping, or undercutting to form an in situ mulch, through which vegetable starts or large seeds are planted without tillage. The goal is to eliminate tillage-related weed seed germination stimuli, and to provide sufficient mulch to suppress weeds throughout the vegetable crop’s minimum weed-free period. Results to date have been mixed, and procedures have yet to be developed that warrant widespread adoption. However, some organic farmers utilize this approach successfully for certain vegetables, notably tomatoes, peppers, and cucurbits. Kuepper, G. 2001. Pursuing conservation tillage systems for organic crop production [Online]. ATTRA publication. Available at :http://www.attra.org/attra-pub/summaries/conservationtillage.html (verified 4 April 2011). Sullivan, P. 2003. Overview of cover crops and green manures [Online]. ATTRA Publication #IP024. 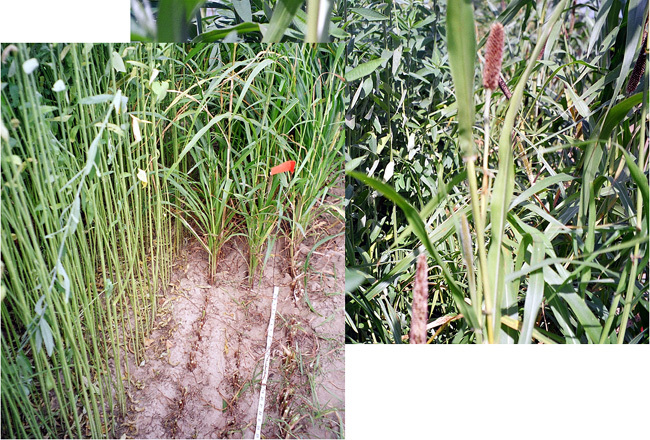 Available at: http://attra.ncat.org/new_pubs/attra-pub/covercrop.html (verified 4 April 2011).